Brunello di Montalcino is made from the Sangiovese Grosso clone, known in Montalcino as "Brunello." The family of Biondi-Santi is credited with "creating" the Brunello wine. 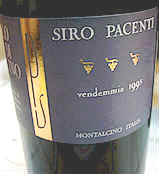 Clemente Santi is said to have isolated the "Brunello" clone and made a wine entirely of this variety. Perhaps a major contribution to the elevation in quality of this wine was eliminating the use of the "governo" method (adding some dried, unfermented fruit to a fermentation tank of wine for an "extension" of the fermentation). The other enhancement was making the wine 100% varietal and NOT using the bland, weak white wine of Trebbiano, nor the fruity Malvasia as was customarily used to water down the wines of Chianti. Biondi-Santi remains a leading producer of Brunello, especially with regard to pricing the wines. We have not had a truly great bottle of Biondi-Santi Brunello. Over the years, the landscape in Montalcino has seen a rise in new estates and a rise in price which would make many Napa Valley vintners smile. Brunello di Montalcino may be one of those wines which are most memorable served with great food. 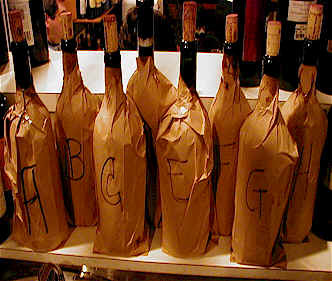 We have often seen the wines show nicely in a blind-tasting format, but the crowd is rarely "wow-ed" by the wines and, more often than not, shocked or horrified by the prices. Yet customers arrive in the shop, having had a memorable Brunello while vacationing in Italy, and wanting to purchase a bottle for a special meal. And the wines can be special and memorable. The blind-tasting format is harsh on this wine. On the other hand, the producers are harsh on consumers when the prices reach high levels. Many in Montalcino will advise opening your bottle of Brunello the day before you serve it to allow the wine to 'breathe.' Our bottles for this tasting were opened an hour prior to the tasting. The criticism here centered on the acidic and seemingly under-ripe theme of this wine. "It smells old and earthy, with a sharp cherry and acid character." said one taste. Someone else felt the fruit was unripe and this was echoed across the room by another who said "It's acidic, has a very short finish and not enough dimension." I found it lightly fruity with a touch of an earthy note to its fragrance. Medium-full bodied and certainly a bit acidic (but not off-the-charts as we have seen in previous vintages), this is mildly tannic and slightly bitter. It may benefit from 5-10 years aging. Standard quality at an amazingly high price. "This fell apart in the glass." said one critic. Another described this as "...smelling sweaty, eggy and showing hydrogen sulfide notes." Someone else found a metallic character in both nose and palate. My notes describe this as being slightly jammy, with an herbal, rhubarb, eucalyptus character. It's a "standard" quality red wine. There are many good wines bearing the "Chianti" name which are of greater interest. Three to five years of aging may bring more to the table here, but not much more. "Green tea and leather" were the adjectives voiced by one panelist. Another felt this has "decent fruit, reminiscent of dark red and black berries." A third taster found it "weedy, thin, bitter and tannic." Someone keyed on an SO2 and grapefruit character. Yet another described this as having a fragrance of "cardboard and a bitter finish." I found a hint of the correct cherry-like notes and a whiff of vanilla...quite interesting, actually. There's a richness to the 'mouth feel' of this wine which I didn't sense in most of the others. Mildly tannic and a nice bit of stuffing...good fruit and cherry notes on the palate along with a woodsy element. One to one-and-a-half stars (scale of three). "Aromatic and spicy," said one critic, while another found the spice element to be reminiscent of cloves. A third felt this was the "...highest in acidity, the most ripe notes, but the tannins really clamp down on the palate." Somebody else said, "In five years, this will be really good." Another found this to have "...cherry notes and gritty tannins" and this sentiment was voiced by another who said it is "way too fierce." Someone else, guarding their wallet, said this is a "good $15 wine." I liked the light cherry notes and the mild wood character. La Casa is a special bottling which was one of the first to be aged for part of its mandatory maturation period in French oak barrels. This has really good structure for a decade of cellaring, showing a bit of tannic "grip." The fruit is substantial on the palate to warrant cellaring. This wine had a number of advocates and a few detractors. The first person sounding off described this only as a "strange wine." Another said it was fraught with "Brettanomyces," which contributes a leathery, meaty element to the wine. Another fellow described the aromas as "soapy, though it has great fruit." Another said "Grapefruit," while yet another taster said "great fruit." One taster found this to be profound, while someone else felt it was "...meaty and having a ripe, rich Brunello smell." I detected H2S at the start and was bothered by this. I either became desensitized to this or it, seemingly, blew off. The wine has, finally, a lovely woodsy scent and dark fruit notes. On the palate, the oak contribution from the cooperage show nicely. The wine is very rich and intense on the palate. Aside from the bothersome off notes, this still may warrant 5-10-15 years of cellaring. One-and-a-half stars, plus. "Ripe, red fruits with pencil shaving notes...ripe...black cherries, cherry and charcoal notes on the finish." said one staunch defender of this wine. Someone else admitted the wine does have a "ripe center, but green and under-ripe on the palate." Another person felt this showed notes of "clove, grapefruit juice with some bitter components." Another taster described this as "metallic." Ellen, who tasted an hour before the group, described this as having "ripe red fruit, a nice amount of sweet oak and a fragrance reminiscent of orchids with good acidity and moderate tannins....hints of begonias and greenhouse elements." 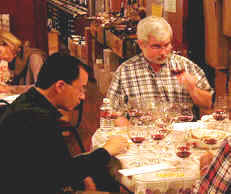 Ellen felt slightly disadvantaged, saying the wines were changing quite a bit as she was finalizing her rankings. I found gorgeous fruit here with exotic spices...cherry and orange peel notes with hints of violets and berries. This struck me as being in full, "living color," compared to the rest of the field which was merely in "black and white." On the palate, the wine shows the same notes in a rich, well-stuffed package. Eight to twelve years of aging may smooth this somewhat, but it's mighty attractive right now! Two to three stars. The first taster described this as showing "Brettanomyces" (meaty, leathery notes). Someone else felt this was "an internationally-styled red wine, smooth and oaky with a caramel texture." Another pegged this as being "a very big wine with a long finish." One fellow said "This is a real crowd-pleaser, until you look at the price tag!" Someone enjoyed the intense "fruity notes on the order of Beaujolais." Another taster likened it to some California reds, calling this a "Zin-Nello." I found a proper level of cherry fruit with a mildly woodsy undertone....quite Chianti-like. A bit acidic and moderately tannic. This will certainly age for many years, but where is it going, I wonder? "Way over oaked with ethyl acetate notes...the oak obscures the fruit." said the first critic. Someone else said this had the "fullest body and a hint of a volatile note." Another sang out, "THAT'S ITALIAN!" One person felt this had a lot of "oak tannins...a lot of good trees died for this wine." Ellen said this has "lots of oak...jammy, red fruit, with lots of sweet oak...good acidity...medium-full bodied and oak-driven flavors with fruit in the background." I had this showing a sandal-wood and cedar fragrance. The vanillin notes from the oak dominate on the palate, but in an easy and caressing sort of way. Very nice. Eight to 12 years of cellaring potential.